✅ LIFETIME WARRANTY: Each combination lock comes with a 100%, no questions asked money back or replacement guarantee. MOST DURABLE TSA APPROVED AND RECOGNIZED LOCK: All TravelMore travel locks are 100% Travel Sentry certified and designed from the ground up to be the strongest and reliable luggage locks in the market. TSA screeners are issued codes and tools for secured acces to open the locks. Our special high strength zinc alloy lock bodies, hardened steel shackles and patented internal mechanisms can take so much force that we back our product up with an 100% lifetime warranty. KNOW IF YOU HAVE BEEN INSPECTED: If a TSA agent has opened your lock and unlocks your suitcase, a red indicator will pop up on your lock under the steel shackle. In this way you can check to ensure all of your items are intact and present while you're still at the airport. You can reset it in seconds using a pointy object such as a pen or paperclip. 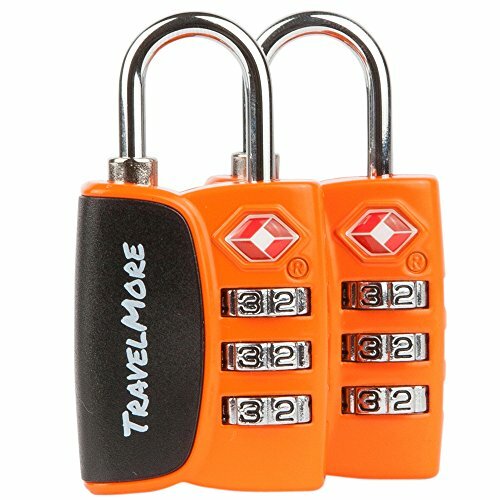 MANY DIFFERENT USES: TravelMore combination locks can be used international on a wide variety of items besides luggage or suitcases. These heavy duty padlocks can be used on a backpack zipper, bagage, gym locker, pelican case, gun case, briefcase, cabinet, toolbox golf bag or laptop bag. SET YOUR OWN 3 DIGIT COMBINATION: Easy to master 3-digit combo can be set to any combination of your choosing for extra security and no key needed! Detailed instructions are always included. 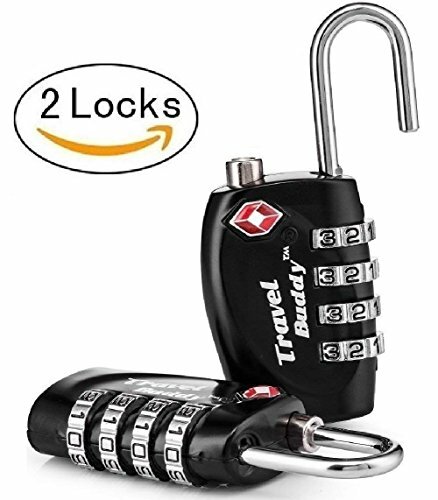 100% LIFETIME WARRANTY: Each small combination airline lock comes with a 100%, no questions asked money back guarantee. If you are not completely happy with our product, let us know and we will do everything to make it right! 【TSA Approved】The locks are TSA (Transportation Security Administration) and Travel Sentry Approved. If Transport Security Officers want to access your bag then they can use their special key to open the lock and they'll relock it when they are finished. 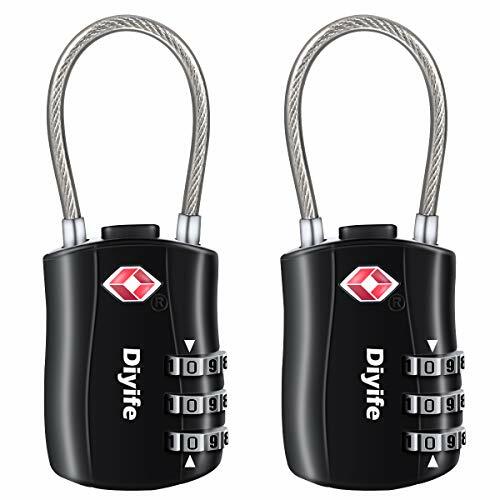 【Multiple Uses】The Diyife locks can be used international on a wide variety of items besides luggage or suitcases. They can be used when travelling on your suitcase or backpack, or they can be used at home, in school, in the gym or on your backpack zipper, bagage, gym locker, pelican case, gun case, briefcase, cabinet, toolbox golf bag or laptop bag. 【Easy To Use】 The 3 dial combination is easy to set and means you don't have to worry about keeping a key safe! The easy press button on top of the padlock means you simply select your combination, press the button and the cable will spring open. The steel cable is easy to use with any latches or zips. 【High Quality】The body of each lock is made from a high strength zinc alloy and the cable is made from strong, cut resistant steel. The only way to open the lock is with the special TSA key or by knowing the combination. You can travel safe knowing your luggage is protected.